Maximum Sun and UV protection. Keep your parked car cooler by up to 50°. The Silver Shield™ is one of the best methods available to keep your vehicle cool when parked. Not only does it reduce interior heat buildup by as much as 50°, it also helps prevent Sun and UV damage to the interior of your vehicle. Each Silver Shield™ is constructed from a durable, 3-ply, reflective laminate material with an inner foam core and is custom fit to your vehicle to maximize windshield coverage. Silver Shield TM installs easily in seconds and stores just as quickly with our handy sewn-in velcro strap. What’s more, with a 5 year warranty you’ll never have to worry about getting into a super-hot vehicle again. The Silver Shield™ is one of the best methods available to keep your vehicle cool when parked. Not only does it reduce interior heat buildup by as much as 50°, it also helps prevent Sun and UV damage to the interior of your vehicle. The Silver Shield™ is constructed from a durable, 3-ply, reflective laminate material with an inner foam core. Each ‘shield’ is custom fit to your vehicle to maximize windshield coverage. Custom sizes to fit most Cars, Trucks, SUVs & Vans. Keeps your parked car cooler by up to 50°. Three layer Mylar and foam construction ensures durability. Installs in seconds and stows easily with its convenient Velcro strap. 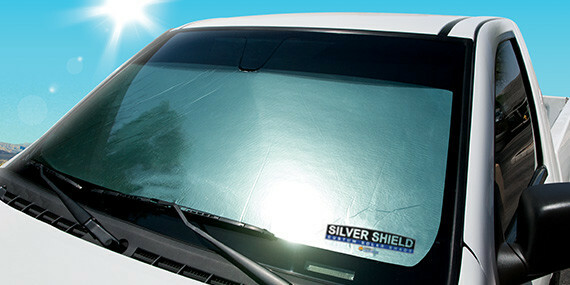 The Silver Shield™ is one of the best methods available to keep your vehicle cool when parked. Each Silver Shield™ is constructed from a durable, 3-ply, reflective laminate material with an inner foam core and is custom fit to your vehicle to maximize windshield coverage. What’s more, with a 5 Year warranty you’ll never have to worry about getting into a blazing hot vehicle again. State-of-the-art CAD CAM© cutting technology is used for precision patterns, giving our Silver Shields™ the best fit, best quality, and best value. Dash Designs© Silver Shields™ continue to set the benchmark for sun protection in the automotive aftermarket industry. Dash Designs® uses the latest in bar-code tracking technology along with 2 quality control checks to ensure that each Silver Shield™ is custom tailored to the exact specifications of your vehicle.